Today, we might feel sad about what is now missing from our lives: the wonderful, loving, caring, fun, intelligent, gentle, sweet man who was so much more than husband, dad, grandpa and friend. But we know that while we may miss him, he is where he wanted to be. So today, we want to celebrate his life with us and share some of the special memories, the gifts that he left for us. He also told us of the many adventures he had in the Air Force. 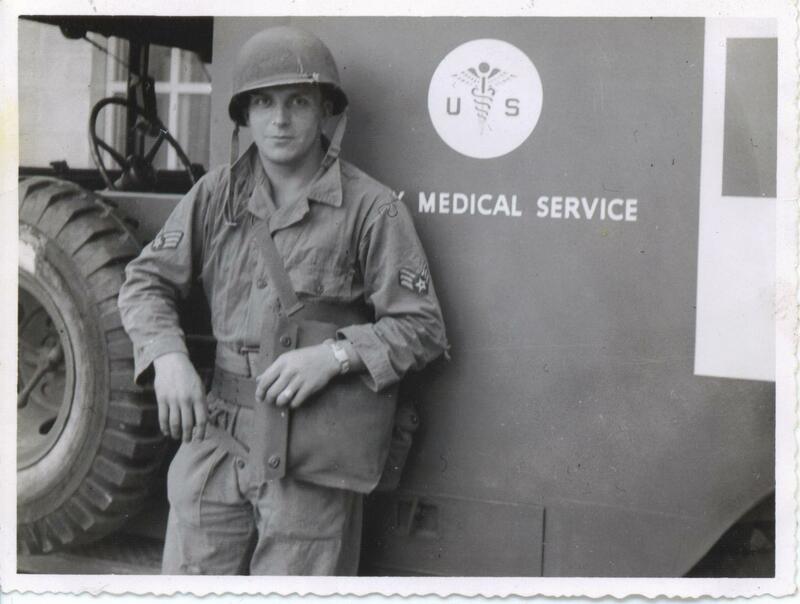 As a medic, he drove an ambulance in France. He had wanted to be a doctor but got dizzy at the sight of blood! I imagine this is probably what fueled his decision to become a pharmacist instead. 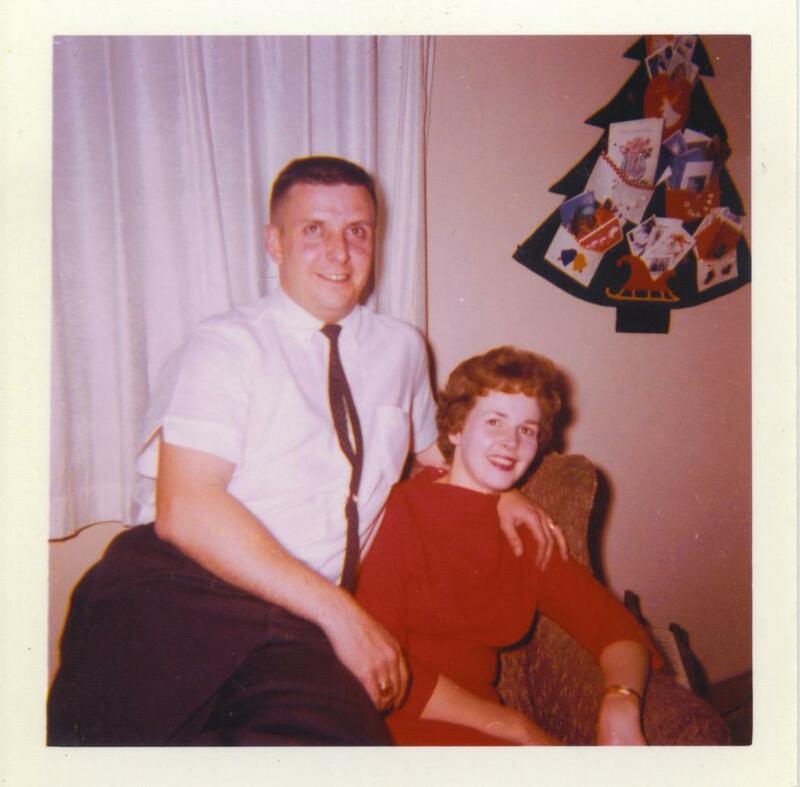 Dad enjoyed dazzling us by speaking and singing in French, which he learned while stationed there. He also knew some German and Italian. 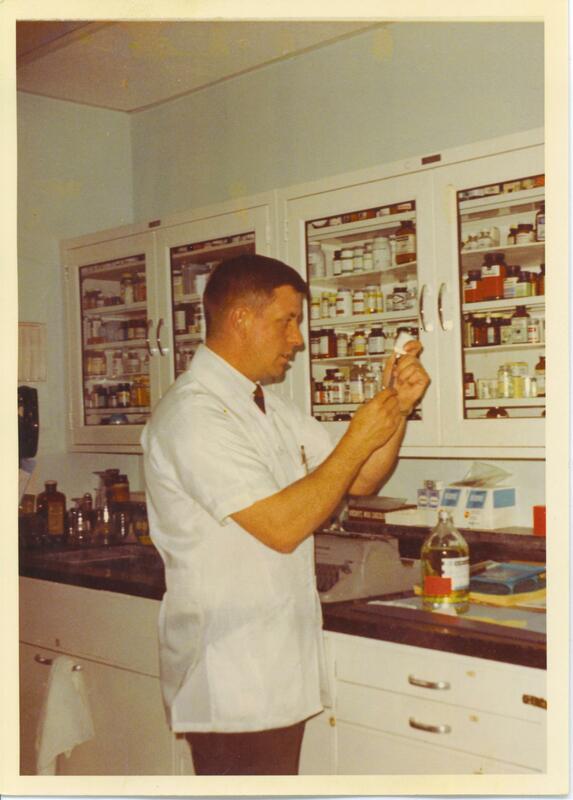 After the military, Dad went to pharmacy school where he met our lovely mom, Barb… he just might have tried to impress her with those language skills! During their schooling he was her teacher’s assistant in chemistry – and found that their chemistry led to marriage. Mom’s special memory of Dad was when they were with a group of people and he said, “I just want to be the best pharmacist I can be”. We know that he achieved that goal. 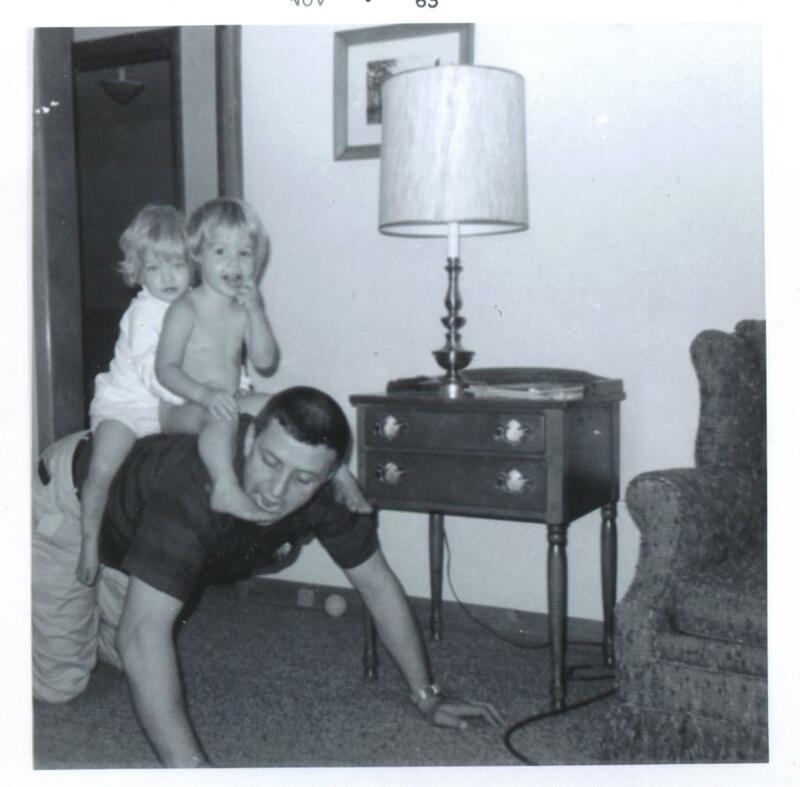 We mostly remember what a fun dad he was and the adventurous things we did together! With Jennie and Stephanie each on a knee, he would let them ride the “horses” Blackie and Whitey. I can just imagine their giggles as they held onto his fingers for reins and he bounced them in a horse race. He also had a very big spider (hand) that came down from above and made us squeal in anticipation of getting tickled. His grandchildren, who each had a special relationship with him, also remember fun times with their “Bumpa”. Bumpa loved his Jenna, Caity, Melissa, Adam, Brian, Ashley, Zachary, Courtney, and Michael! Imagine driving out to the country on summer nights, lying on top of the car and looking at the stars… I could always find the Big Dipper and the Little Dipper. One of Mike’s favorite memories is of fishing with him at Tub Springs, Nine Mile Creek and Box Butte Reservoir. The family would often hike and cook out at the Wildcat Hills, and he even took us to the dump to search for additions to Mike’s beer can collection. Olde Frothinslosh was by far the best can in the bunch! We remember trips to Alliance to see Grandma and Grandpa, and vacations in the station wagon to Yellowstone, Wisconsin and Illinois. Dad supported us in all of our band concerts, musicals, sports events and coached Mike’s Little League team. At my first basketball game when I scored a basket for the other team, he wrote a funny poem to make it all better. “A tisket, a tasket, she scored a great big basket…” I wish I could remember the rest! There’s no denying that our dad was a funny guy. 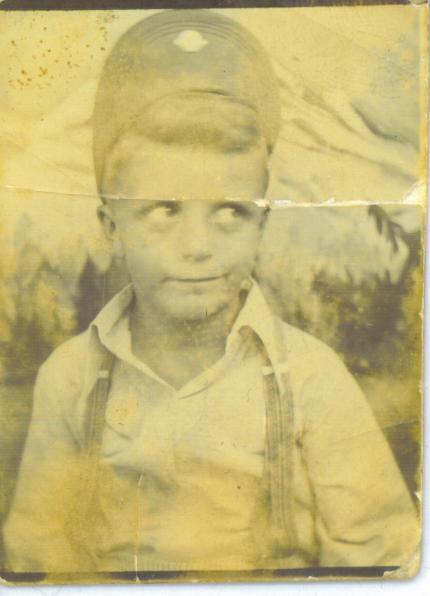 We have many photos of him in funny hats and making funny faces – even one of him wearing a dress for a Lion’s club play. People often speak of Dad’s jokes and his smile. 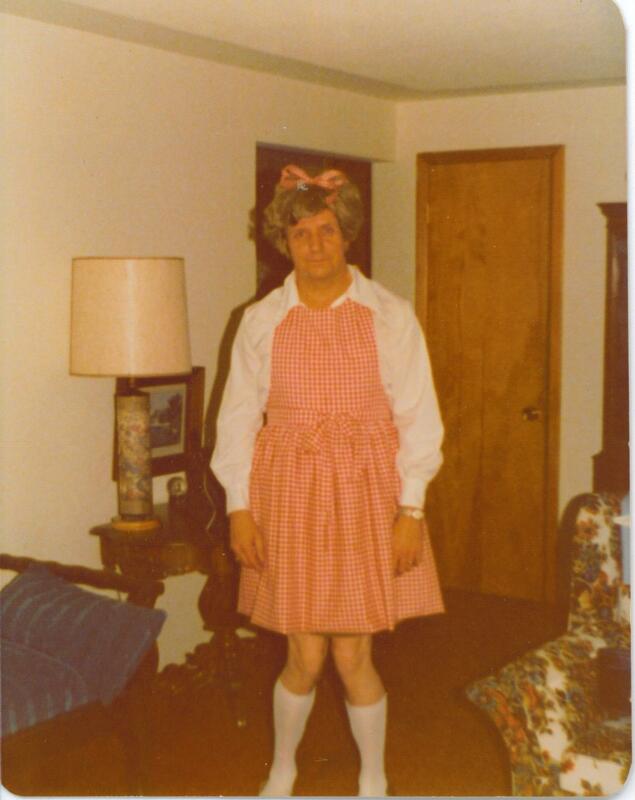 He liked to occasionally embarrass us, too! He would honk and wave driving down Main with the girls, trying to see how many honks and waves he could get! Silliness aside, Stephanie’s favorite memory of Dad was when he taught her to drive. 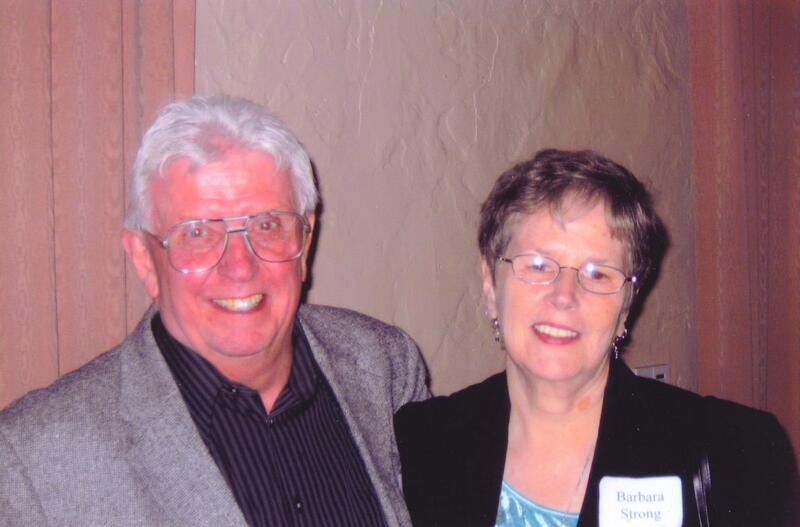 Being a service-oriented man, dad was an active participant in the church, serving communion and greeting members. He also participated in the Lion’s club – a reminder of that is the Lion drinking fountain that they installed at the zoo. When one of Stephanie’s friends needed scoliosis surgery, it was our dad who spearheaded the effort to raise the money to make that happen. For that, he will be remembered also. Jennie’s favorite memory of our dad is of him dancing at her wedding. He loved to dance and he loved music – everything from CCR to Tchaikovsky! Mom and he took country swing dance lessons and had a great time together! Stephanie and Dad were regular musicians at Saturday night mass at St. Agnes, as well as playing the guitar and singing at home. At just about any time he could be heard singing or whistling a tune in his own special style. He liked to start a phrase about a half beat behind everyone else, and we could pick out his voice anywhere. Dad especially enjoyed making up funny lyrics, such as “50 ways to love your liver”. Customers at Taco Town were in for a treat when he sang along with the Juke Box! We love you, Dad. Shine on. What a beautiful way to remember your dad. Susie, that’s a beautiful remembrance. He really was a special man. Wonderful! Printed for our archives. Thank you so much! I’m glad you liked it! Hope you are both well!